Octavio Moreno Lara and his family line up for a team picture: grandmother, Guadalupe Cortes; dad, Felipe Moreno Longoria; Octavio; mom, Xochil Lara Cortes; and front row, Octavio's sister, Carolina Moreno Lara. 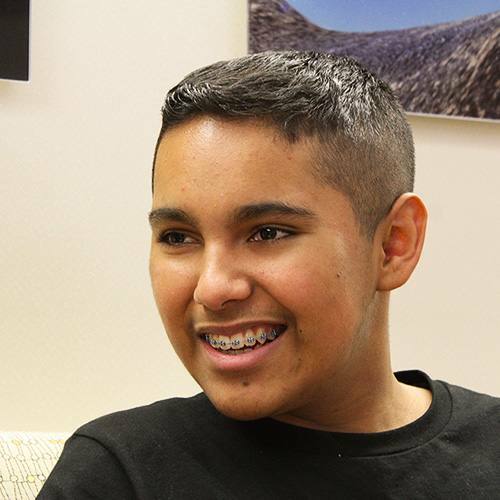 It was a long road through proton beam therapy for 14-year-old Octavio Moreno Lara. But compassionate care from his Mayo Clinic team, coupled with some fun events, lightened the mood along the way. Octavio Moreno Lara describes his last proton beam treatment at Mayo Clinic's Arizona campus as "bittersweet." The "bitter," he says, was "having to lie so still during my treatment with nothing to do," something most active 14-year-olds might find frustrating. But Octavio says the "sweet" part was "all the therapists who treated me so well." The six weeks Octavio spent in Mayo Clinic's Proton Beam Therapy Program were focused on treating a cancerous brain tumor. Although the treatment wasn't easy, he says the compassionate care he received, along with some special outings he enjoyed during his time at Mayo Clinic, made it a bit easier to take. Octavio's issues began five years ago when he went through two brain surgeries to treat several brain tumors. Octavio says that the symptoms caused by his condition were difficult to handle, especially at school, where he says he "fell down a lot." Schoolwork was also a challenge. "It was getting hard to keep up the pace," he says. It's been a tough road for his family, too. "It is great to be Octavio's dad," says Felipe Moreno Longoria. "But it has been painful to see him go through so much suffering." There have been bright spots, though. Reflecting on his extended time at Mayo Clinic for proton beam therapy, Octavio lights up when he describes a fun night out with his dad. 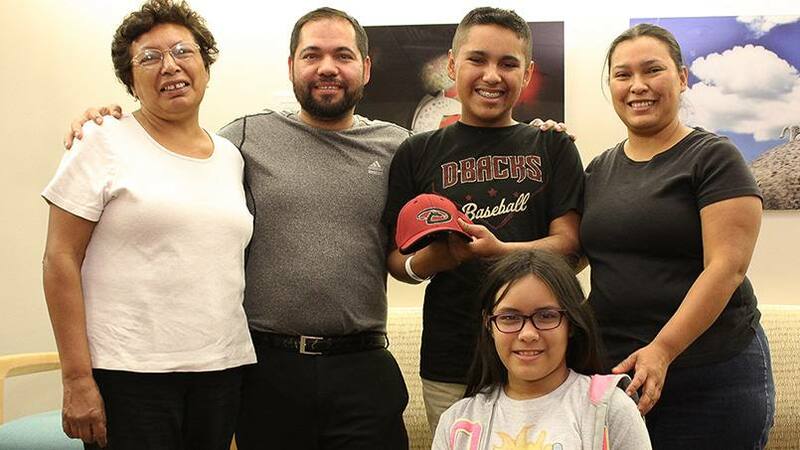 It was a much-needed respite when an anonymous donor provided Octavio with two tickets to an Arizona Diamondbacks game against the San Francisco Giants. "The D-Backs won!" says Octavio, adding that the night with his dad was very special. Octavio also attended a professional soccer game featuring the Phoenix Rising, where he was escorted onto the field by the team captain, so he could be with the players during the national anthem. On his last day, Octavio's family — his mom, dad, sister and grandmother — were there for his send-off. To preserve the memory of his time at the ballgame, the family lined up, team-style, for a photo. Octavio's therapists also describe the completion of Octavio's treatment as bittersweet. They came out to witness Octavio ring the bell in the treatment area — a tradition that marks the final day of therapy. Seeing their patient leave was exciting, yet emotional for the proton beam team, who describe Octavio as a "great, well-mannered kid." Hugs were plentiful as Octavio and his family said their farewells. Octavio told his care team: "All this makes it hard to leave." Read about Mayo Clinic's Proton Beam Therapy Program. Connect with others talking about pediatric brain tumors on Mayo Clinic Connect.